As the traditional instrument of Scotland it is an honour to play this great and under-rated instrument, and the ceremonial roles of bagpipers across the ages make very interesting reading. Many who play the pipes now do so because their ancestors did, and because the tradition has always been carried on, and many bagpipers play in traditional pipe bands, an age old tradition that is still rife in Scotland. Further use for bagpipers comes in the military, where the long standing tradition of Scottish regiments having a piper, who would – in days of old – lead the troops onto the battlefield – is still played out in a ceremonial fashion with many military bands featuring bagpipes. In fact the ceremonial use of bagpipers are very much alive these days, at civil ceremonies as well as in military spheres. 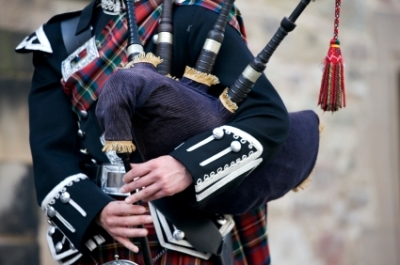 Being able to play the pipes, dressed – of course – in traditional Scottish garb and family tartan – can be lucrative and is a great honour, and some of the quaint services that require a piper are steeped in history. Bagpipers are in great demand on Burns night, 25 th January, a celebration which, in Scotland, ranks high on the list of many. Celebrating the birth of the great Scots poet Robert Burns, the night is one of readings of poetry, drinking of whisky and eating of the traditional haggis, to which Burns himself wrote an eulogy. Tradition has it that as the haggis enters the room it is accompanied by a bagpiper playing one of the traditional songs of the evening, and this ceremony is treated with great reverence by those present. With many Burns night suppers taking place across Scotland each year on the 25 th of January – and in the border areas of England where the tradition is also upheld – bagpipers are sought after musicians for this one night. Other traditional uses of bagpipers are for weddings, where many Scottish and northern ceremonies invite a bagpiper to pipe the bride into the service, and sometimes out again. This solemn and honourable ceremony is one that is also carried out with great honour, and there are many bagpipers who consider it the ultimate accolade to be asked. Funerals are another occasion when bagpipers are asked to perform a solemn and graceful tune, and the sight of a bagpiper leading the hearse or funeral procession is one that is never forgotten. Traditional parties and celebrations such as 21 st birthdays and the like are also popular places for bagpipers to play, and there is always a call for a bagpiper when there is something to be celebrated. Bagpipers are considered essential in many official capacities, and the use of them in all manners of celebration or marks of occasion goes back many years. Traditions such as these help to keep bagpipers playing, and also encourage younger people to learn to become competent bagpipers. It is not the easiest of instruments to play, but being able to perform at a Burns Supper or other important and revered celebration is the culmination of many years of learning and practice.